If Hayao Miyazaki had become a game designer instead of a film director, he would have made Journey (no Ni Nu Kuni doesn’t count). Thatgamecompany fill their third major outing with an abundance of wonder, joy, and imagination that rivals the emotional range of Studio Ghibli’s Spirited Away. The major difference between Miyazaki’s and Chenova Chen’s visions are the mediums in which they choose to express themselves. Journey’s interactivity elevates the experience that, if you’re open to it, can be had through video games. Journey shows how play can provide the player with a wide emotional palette without relying on overly complicated mechanics and traditional rewards systems. Journey could be easily categorized as a 3D platformer, but it distinguishes itself from that genre by evading many of its conventions. The game never focuses on timely and difficult traversal of obstacles. It instead emphasizes the fluidity of motion and fostering a streamlined experience that never arouses frustration in the player. There are only two button inputs: jump and sing. The central mechanic of the game is the flying-like leaps of your character. You collect scarf pieces as you go that allow for longer and higher jumps that will at times have you surfing down the games many slopes (this is about as “gamey” as it gets). The scarf acts as an embedded jump meter, glowing symbols woven into the fabric indicate the amount of energy the player has to jump before requiring a recharge. It’s one thing to discuss the floating leaps of the game than to experience them. There is a weightless sensation akin to an underwater creature gracefully propelling itself through water that fosters instances of awe in the player. Jumping works in tandem with the singing mechanic, which allows the player to activate scarfs, scarf creatures, and is the primary means of communication between players. These two simple mechanics stay fundamentally the same throughout your journey, but are evolved through the way the environment asks the player to interact. There are similarities with games like SSX and 3D Mario, but Journey’s context, style, and relaxed gameplay add a completely unique and powerful feeling to these instances. At first glance Journey is obviously graphically beautiful, but this beauty goes beyond visuals to include the brilliant art direction, music and sound all supported by equally elegant game design. The game seeps intuitiveness. Only a few button prompts teach the player the basic controls, an added bonus of the simplified gameplay. There is no HUD. Any of the other maneuvers the game asks the player to perform are learned through experimentation and common sense implementation of the game’s core mechanics. This ingenuous design decision emphasizes immersion in the world. Gameplay provides most of the narrative for the player, with secondary visual storytelling acting as a supplement. There are no evasive and extensive tutorials, no objective markers, none of the trappings and handholding of modern game design. All of the conventions that scream “Hey, I’m a game and don’t you forget it!” are refreshingly exorcised from the game. Thatgamecompany seems well aware that these conventions take away from the experience, Journey’s main preoccupation, that they alienate the player from being and acting in the world. The game as described would have been enough to solidify its status in the gaming canon, but the clever co-operative multiplayer pushes the game even further than expected. Multiplayer lobbies or matchmaking are non-existent. You can and will randomly run into a player controlled avatar at some unspecified moment during your travels. Your only means of communication are simple gestures through movement and song, which along with bodily contact between characters allows you to recharge each other’s scarves. This lack of or restricted communication has the counterintuitive and amazing effect of uniting the two players in a type of camaraderie. This, of course, is my own experience, as there are stories of players who actively avoided the bond the game’s communicative restrictions foster, which is an interesting experience in itself. There is great incentive in teaming up, as it allows you to do more than you could alone, but it is not necessary. The game permits you to help each other or not intrude at all in each other’s playthroughs. If you do participate in this alliance, you’ll find yourself waiting for your partner at different points of a level, attempting to say thank you through song, and ultimately growing fond of their company as you both partake on this journey. This feeling of connectedness and responsibility wouldn’t be possible if traditional voice or text were used, as many other factors would hinder the opportunity of establishing this bond. The multiplayer also accomplishes the difficult task of embedding multiple human players into the narrative without becoming disjunctive, without breaking the metaphor of the game. In other words, the other player becomes part of the narrative in a way that makes sense in the lore and does not come off like a form of digital puppeteering. Journey’s greatest contribution to the medium is the way in which it systematically shirks those gaming conventions gamers believe are necessary for a game to be game in favor of enabling the player to perform in and be a part of another world. The claim that Journey has no replay value because of such a focused objective and rejection of traditional game design seems perfunctory. Gamers have grown accustomed to being able to go back to a higher difficulty, a new game plus that brings in new loot and enemies. This expectation undermines the experience of the game. 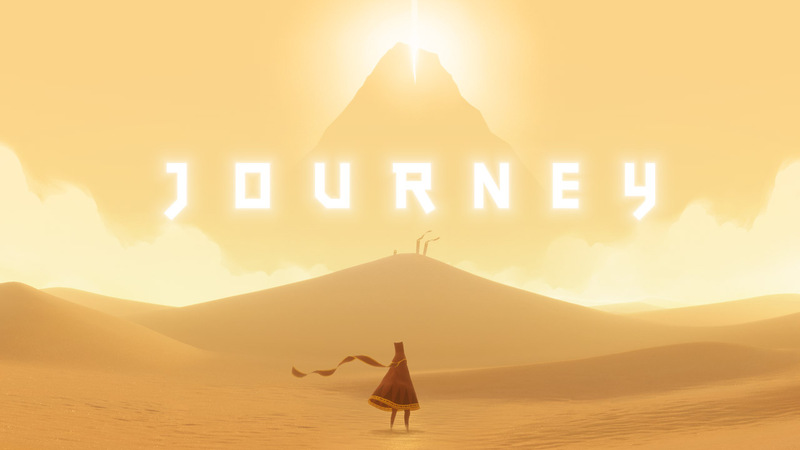 Journey’s replay value is there in the adventure itself. That is the reward. The same sense of wonder of course is not there, but like all great works of art revisiting the game allows new experiences to be had.